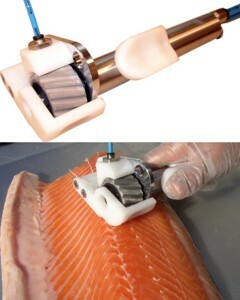 FTC-Trio is introducing the patented modular Ergo-Light pin bone remover with speed & pulling power control and a unique mechanical picking action which gently removes pin bones from nearly all fresh/defrosted and smoked fillets. The Ergo-Light PBR is air powered and has been developed and tested to meet even the worst working conditions. Larger automated machines are also available and have already been installed in South Africa. Cold and fresh slicers are on offer from Salmco. The Salmco 3029 cold slicer can cut a variety off angles and includes an integrated interleaving system which feeds plastic films between slices: a huge labour saver. 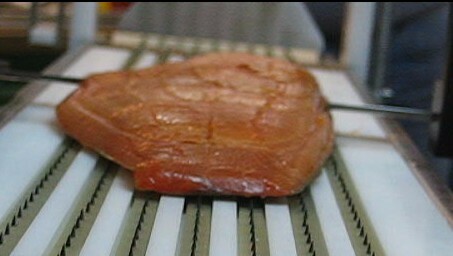 Soft slicers can slice a complete cold smoked fillet at room temperature. They are adjustable to cut at angles varying from 10 degrees to as much as 40 degrees, and the slice thickness can also be easily and accurately set to as thin as 2mm, utilizing the complete fillet. Throughput varies from 65-70 slices/min. A dual lane system doubles the capacity. Salmco machines have been used to slice: raw, fresh, cold smoked, frozen: Trout, Halibut, Mackerel, Eel, Swordfish, Marlin, Tuna, Mahi-Mahi, Hoki, Pollack, Cod, Snapper, Seabream, Sturgeon, Carp and even Duck breast. A number of Salmco machines have already been purchased by South African processors.